Some camping tips can be over the top. 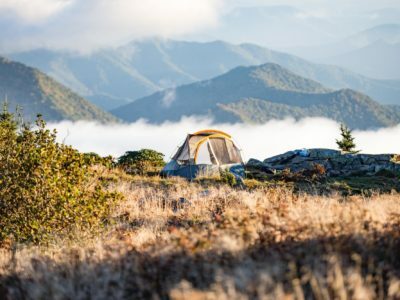 When really heading to the hills on a camping trip is all about getting back to basics; leaving the strain of the modern world behind and decompressing among Mother Nature’s glorious bounty. No screens, no deadlines, no 24-hour news cycle. Just you, your friends, your backpacks, and the wilderness. Pure simplicity. That’s why we love it. That said, there’s a lot of unnecessary machismo around camping. Some people seem to think that camping has to involve at least a little bit of suffering. And if it doesn’t, you’re not doing it right. But I, for one, don’t subscribe to these theory. I love getting back to basics, I love being one with nature but I also love being comfortable, warm, and safe. And what do you know? It is possible to have it all. Even if you’re sleeping on a Caribbean beach, the key to camping is all about being prepared for the conditions. When you’re out in the hills and the sun falls below the trees, the night can get cold quickly. That’s why the first of our camping tips is about investing in good gear. I know camping can seem like an expensive hobby, but that’s only true when you take a short-term approach. A good multi-season sleeping bag might cost you well over $100, which sounds expensive. But if you look after it well there is absolutely no reason it won’t last you for years and years. means you spend more nights camping on your holiday than sleeping in hotels, then return on investment is a easy to see. You will easily make that money back in a night or two.
. Obviously a tent fit for purpose is going to cost a little bit more initially compared to a festival tent you might find in the bargain bin at a gas station. But when it comes to longevity there is no competition. I’ve had tents that have lasted longer than some marriages! 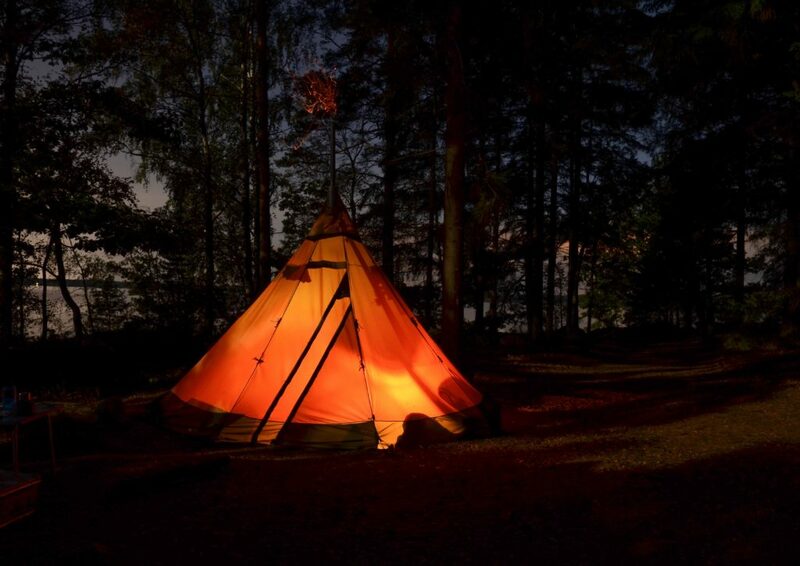 Camping is definitely one of those pastimes where spending a little more initially can pay big dividends down the road. And in most cases we’re only talking about a little bit more money for better quality. The difference between a standard sleeping bag and a good one is pretty much the cost of a meal out. Stay in this weekend, have a sandwich, and spend the savings on good gear that can go with you practically anywhere. Nothing can ruin a camping trip quite like a sleepless night spent tossing and turning. Not only will that evening be spoiled but so will the following day. You’ll have bags under your eyes bigger than a sleeping bag and likely be so grumpy that fellow campers will secretly hope you become a bear snack! More important, when you’re tired you’re more prone to make mistakes, lose your footing, or get injured. to match any style of camping, from extreme backcountry to glamping. If you already have an inflatable bed and find that’s not the most comfortable, then have a look at this handy guide on what you can do to primp it up before you pump it up. This is possibly the most important of my camping tips. Can you imagine being more uncomfortable than when you’re deep in the woods, realizing every single piece of clothing you have is wet? It might not be a problem during the day when sunshine and body heat is working in your favor but when you lay down at night, however, things are going to get cold quick. The solution is to always have an extra pair of dry clothes to change into at night. But don’t just trust that your backpack will keep clothes dry either. 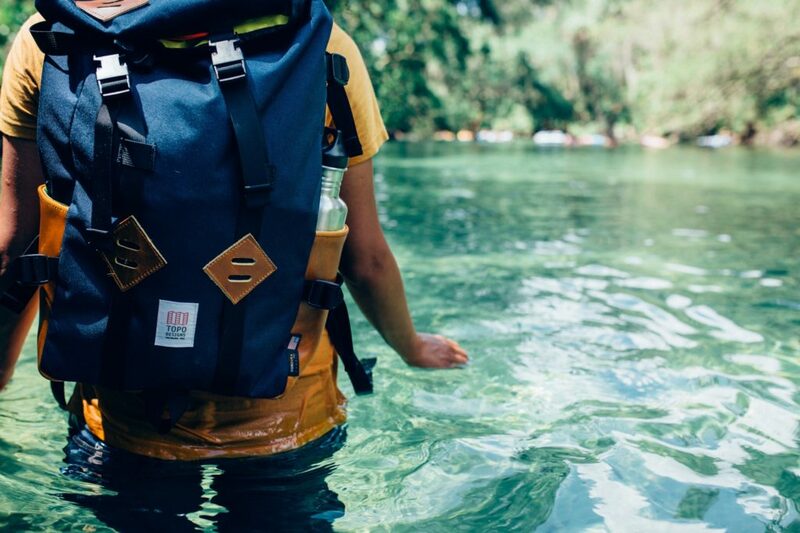 Most backpacks are not 100% waterproof, so you’ll be in trouble if the heavens open or you somehow drop your bag in the creek. It happens. More than you think. or even just a sturdy reusable bag to protect the clothes you’re not wearing. And always, always, change for bed. Even if your clothes don’t feel damp, they usually hold at least a little bit of your own sweat. As night falls, this moisture will evaporate and your body temperature can plummet. It’s definitely worth the extra effort to bring a change of clothes to make sure you stay dry and warm! 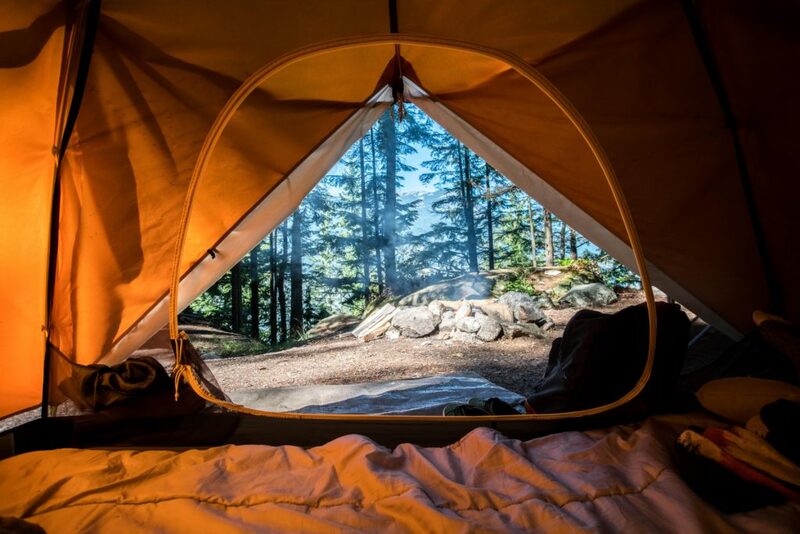 And there you have it, camping fans–three camping tips to improve your comfort and safety during your next camping trip. Remember the woods are fun, but they also demand our respect. Conditions can change quickly, and it’s up to you to be prepared. All you need is good gear and a sensible head on your shoulders. 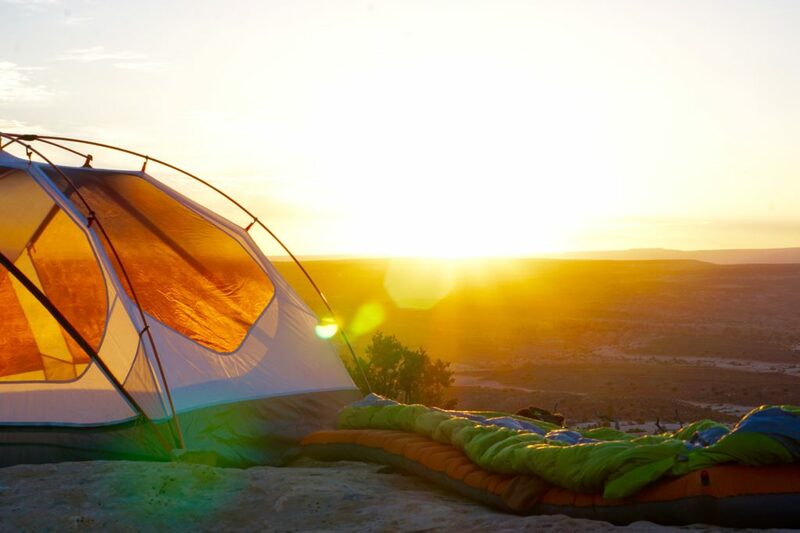 What are your favorite camping tips for enjoying the great outdoors? About the Author: Sarah Cummings is a freelance writer. When she’s not writing about sleep or practising yoga on the beach, you can find her hiking to new camping spots. She and her family are definitely adrenalin junkies who love nothing more than spending time in the Great Outdoors! Most people don’t know this, but I have a personal history with the Grand Canyon. My parents took me and my sister for the first time when I was 10 years old. Back then I had the National Parks Passport, though before this we’d spent most of our family vacations at Disney. By the time we left, the Canyon had implanted me with a travel bug. I can honestly say it was that trip that inspired me to start exploring. But despite living in San Diego for almost 12 years, I hadn’t been back to hike the Canyon since. So when we first considered going for a trip in December, I wasn’t even sure Grand Canyon winter hiking was a possibility. It had been summer when I was there the first time– but I was desperate to see it blanketed in snow. At over 7,000 feet of altitude, I knew things got cold at the South Rim, and I remember hearing that the park closes the North Rim to visitors each winter. I immediately assumed that meant the iconic Rim-to-Rim hike would be completely out of the question. What. A. Bummer. That hike has been at the top of our backpacking list for ages! Luckily, after a bit of research, I came across an obvious solution to our problem. With no services open on the North Rim, we’d just have to turn around and hike back out to the South Rim! Instead of Rim-to-Rim, we’d hike Rim-to-Rim-to-Rim (before you get excited, they don’t make stickers for this one). Now, Annelise, a warm-blooded California native, was not nearly as enthusiastic about my Grand Canyon Winter backpacking proposal. So I promised that Rim-to-Rim-to-Rim would not only be spectacular, but that it wouldn’t be THAT cold. And after she gave a reluctant go-ahead, we faxed in a last-minute backcountry permit request to the Grand Canyon backcountry office. It’s worth noting here that while I love being spontaneous, I might have gotten lucky on this one. It’s usually recommended that you plan your trip and fax your requests in about four months in advance. Fortunately we were able to get email confirmation within two days. They had approved our second route option and our earlier set of dates, which meant we only had a little time to gear up! Even if you’re able-bodied, poles distribute the brunt of the impact on your joints on both the ascent and descent. And with days in which you lose (or gain and lose) 4,000 plus feet of elevation, it’s worth sparing your knees a bit. just in case. They’re reasonably priced and lightweight enough to carry in case things got a little icy. which are designed to keep you warm and dry in both cold and hot conditions, so we figured we’d get good use out of them no matter what. Gear sorted, we drove straight from San Diego to the park and stayed at a hotel just a mile from the Grand Canyon entrance. It’s about an eight hour drive, and we broke it up with a solid lunch at the Iron Horse Grill and Restaurant in Salome (64638 US-60, Salome, AZ 85348). Needless to say, we were still relieved when we arrived at the hotel. Our room had patio access to an indoor courtyard with a jacuzzi and lounge with enough foliage that it almost felt like we were outside. Good thing we weren’t, because when we left at 7:30 the next morning it had snowed a few inches overnight! I was stoked because I had secretly been hoping we’d get to see the Canyon in snow. However, I had to de-ice the car windshield with a surf wax comb. Pro-tip: Always carry an ice scraper! 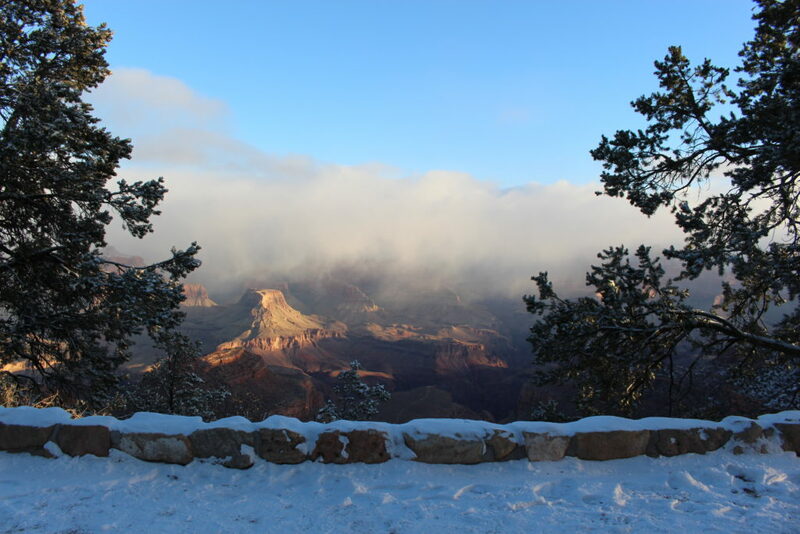 After entering the National Park with time to spare, we parked outside the Bright Angel Lodge, walked around the snowy canyon, and went inside for a coffee. Then we packed our bags and headed to the bus stop for the Hiker’s Express, which runs from Bright Angel Lodge at 8 and 9 AM. 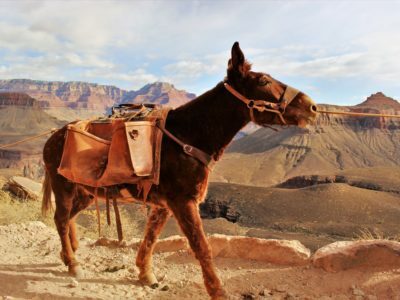 The last stop is the South Kaibab Trailhead, which would be our starting point for Rim-to-Rim-to-Rim– though you can also hike down Bright Angel Trail. 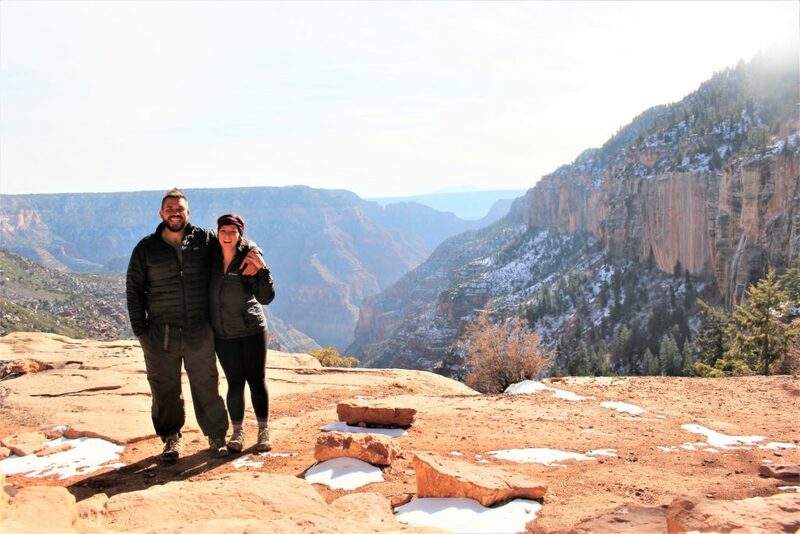 Since we decided we wanted to hike up the Bright Angel Trail on the way out (because it’s a bit longer but less steep), we decided to hike down the South Kaibab Trail to switch it up. 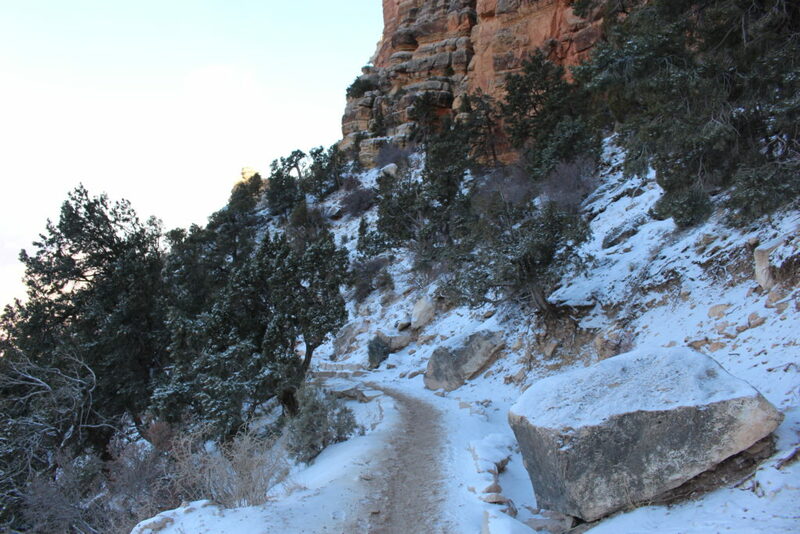 Also the South Kaibab Trail is more exposed to direct sun than the Bright Angel Trail, so if snow is an issue, it is generally thought that it will melt on the South Kaibab Trail first. That said, the climb down was an unrelenting 7.5 miles with a loss of 4,720 feet in elevation. Did I mention that trekking poles are so helpful with a full pack? Still, the first day was filled with wind gusts, spectacular vistas, mule trains, and a history lesson in geology as the rock formations and colors changed at every new angle. After a four-hour downhill hike, we arrived at Bright Angel Campground. For a downhill day, it was admittedly more taxing than we anticipated. On day two, we left for Cottonwood Campground at about 9:30 AM. Over a drastically different seven miles, we only gained about 1,600 feet of elevation. While I’d imagine the shade of the canyon walls along Bright Angel Creek would be very welcome during warmer months, we spent most of the morning trying to warm up. On the upside, and probably one of my favorite things about hiking Rim-to-Rim-to-Rim during the winter, the crowds got smaller and smaller the closer we got to the North Rim. There’s something special about finding yourself in a place like the Grand Canyon and not seeing another soul. At Cottonwood, we found a nice flat site (number three, if memory serves) close to the creek and still in the sun. We soaked up all we could before it tucked behind the Canyon around 4:30 PM. Day three, or Big D3 as Annelise affectionately called it, was the one we had been preparing for mentally because it would cover 14 plus miles gaining and then losing 4400 feet. But because we’d return to camp at Cottonwood, we left our tent setup and hiked out early with lighter packs. We left right at sunrise, around 7:30, to ensure we’d make it back to camp before the early winter sunset. The hike from Cottonwood to the North Rim was as awe-inspiring as it was difficult. We filled our water at Manzanita Rest Area, about two miles from Cottonwood, because the water spigots at other areas of the North Rim are closed in the winter months. From there, we cruised straight past Roaring Springs, passing only one guided group on the way. The climb to the Supai Tunnel and the Coconino Overlook was narrow and icy in some parts, but there was very little wind. It’s worth noting that you can’t be too careful here, as this was easily the scariest portion of the trail, situated along fairly sheer cliffs (another reason for poles). Toward the top, the snow returned, but not enough to warrant our microspikes. Although the view from the top was not quite as striking as the view from the South Rim, we were still elated to have made it. Yet harsher wind and its accompanying chill drove us back down the hill to find some sun. We hiked back down the .6 miles to the Coconino Overlook, where the view was both spectacular and drenched in sun. Grateful for the reprieve, we stayed here for an hour to have lunch in the sun all by ourselves. And after the refuel, we hiked the seven miles back to Cottonwood, arriving by 3:45 and with enough time to enjoy more sun. On Sunday, Christmas Eve, we left the Cottonwood Campground around 9:30 to get back to Bright Angel Campground. We had initially planned to fill our easy seven-mile, moderate downhill day with a detour to Ribbon Falls, but some signs made us concerned the bridge was closed. Going backwards from Day Two, the easy downhill slope was covered mostly in shade. We pushed on until we found a nice sunny spot by the creek for lunch. From there it was just a few miles back to Bright Angel Campground, where we arrived by 2:00 PM, greeted by mule deer. We set up camp in site number 10, next to the creek, and went back to the canteen to play cards outside. After I beat Annelise at Rummy 500, we celebrated with a couple of Bright Angel IPAs inside the canteen before it closed for dinner prep at 4:00 PM. And, because it was Christmas Eve, we were treated by my family to a family-style steak dinner at Phantom Ranch right at 5:00 PM. They also serve stew to a later crew at 6:30 PM and re-open between eight and ten for the night owls. We spent most evenings confined to our tent to stay warm, but when the sun set we were thrilled to see several people had put up lights to get in the Christmas spirit. With more people nearby, we woke early Monday morning and packed up camp by 8:30 AM. 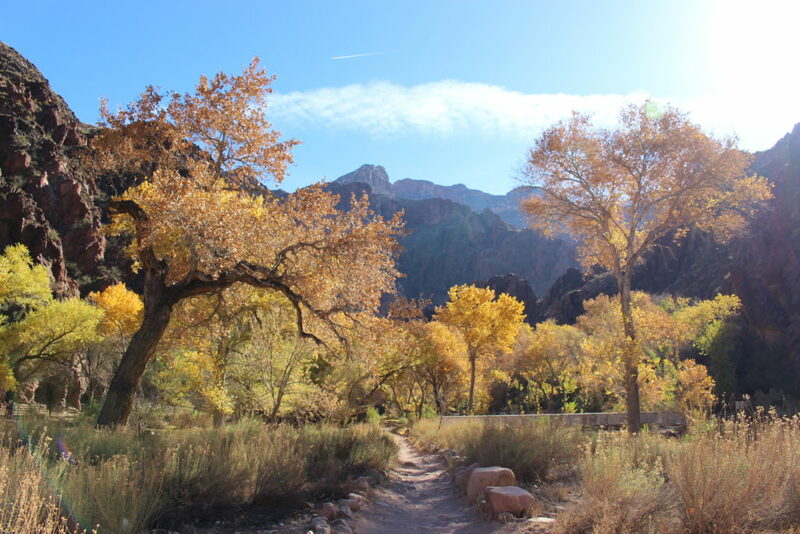 We filled our waters once more, knowing there wouldn’t be more until 4.5 miles up at Indian Garden Campground, and hiked up past the River Rest House. We crossed back over the Colorado River and dawdled a bit soaking up the incredible views. The Devil’s Corkscrew (an intense series of switchbacks) starts shortly after, and slowly but surely we started crossing paths with more people. We continued on past Plateau Point and went straight to Indian Garden Campground, the only other place water was on on the south rim, to have lunch. Eager to complete our journey, we trekked another 4.5 miles from there to the top of the canyon, where we arrived by 2:00 PM. We had made a reservation at the Bright Angel Lodge–and were so glad we did. We checked in early, had showers and caught the last half of the holiday football game before having dinner. And even though we couldn’t find R2R2R stickers, we’d recommend it anyway. 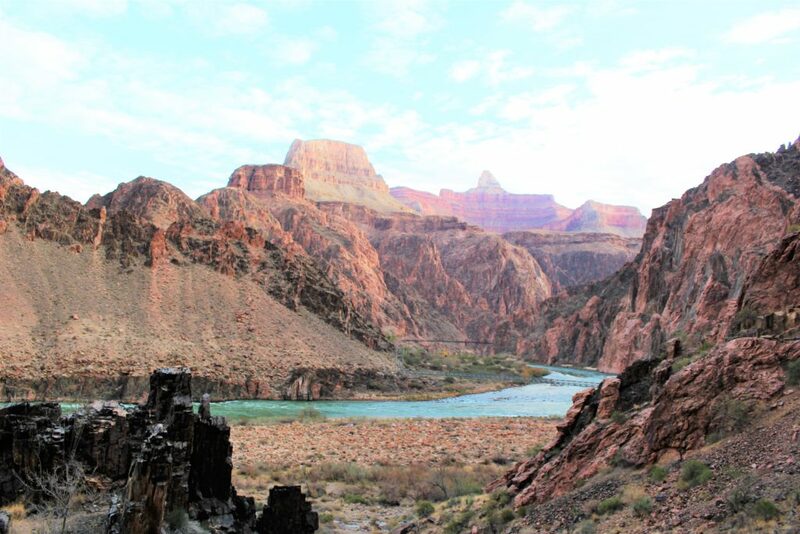 Please also note that hiking in the Grand Canyon can be extremely dangerous in both winter and summer. Always make sure you consult the park and bring adequate supplies. Every step you take into the canyon is a step you have to take out, and neither shade nor running water is always guaranteed. If you have any questions about our route, what we packed, what we ate, or what we saw, feel free to write us here. It’s not often that we write posts about the places we call home. As travel bloggers, we’re always writing instead about the faraway places that stole our hearts or are sure to steal yours. It’s easy to forget that travel, exploration, and adventure are not limited to international flights or cross-country road trips, or that adventure doesn’t need to be extravagant to change your perspective. 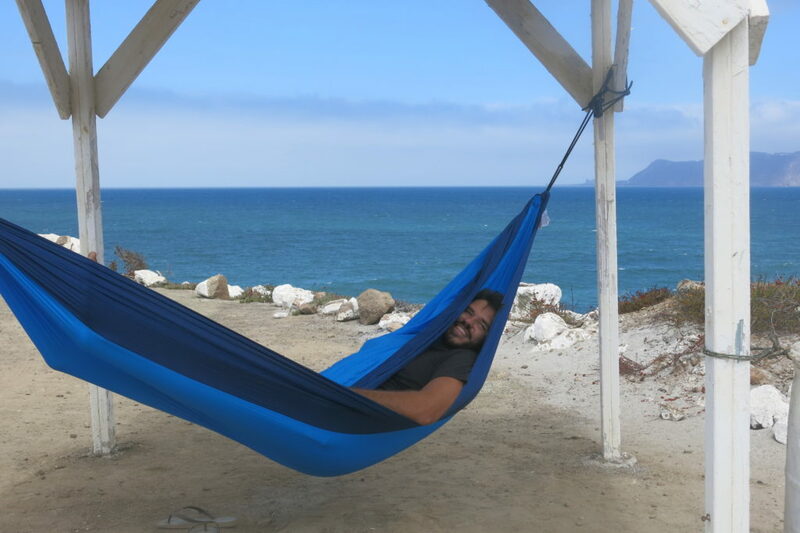 In fact, and especially as California residents, we’re as inclined to explore as much nearby – like Baja camping – as we are anywhere else simply because there’s so much to see. I probably don’t need to tell you this, but I’m going to anyway: One of the best things about living in California, and San Diego in particular, is the access to all kinds of nature. Not just any nature. Like, ALL nature. This great state is widely known for its giant sequoia forests, its massive snow-capped mountains, its pristine beaches, and, yes, even its sprawling, dry desert. When nature junkies want it all within reach, California answers the call. While the climate is usually quite moderate, the temperature rises slightly in the summer months and the streets overflow with visiting tourists. We head fast for the van, but during these months, the nearby desert camping can be less appealing. It’s just too hot for anyone’s general enjoyment during the day. 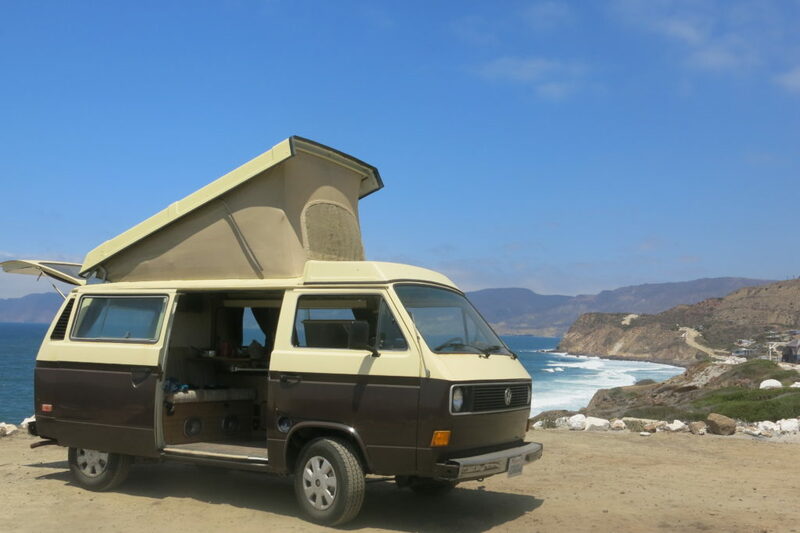 Instead, we recently planned a three-day trip down California for a little Baja camping, where the conditions are blissful and the Mexican food is even better (and cheaper). 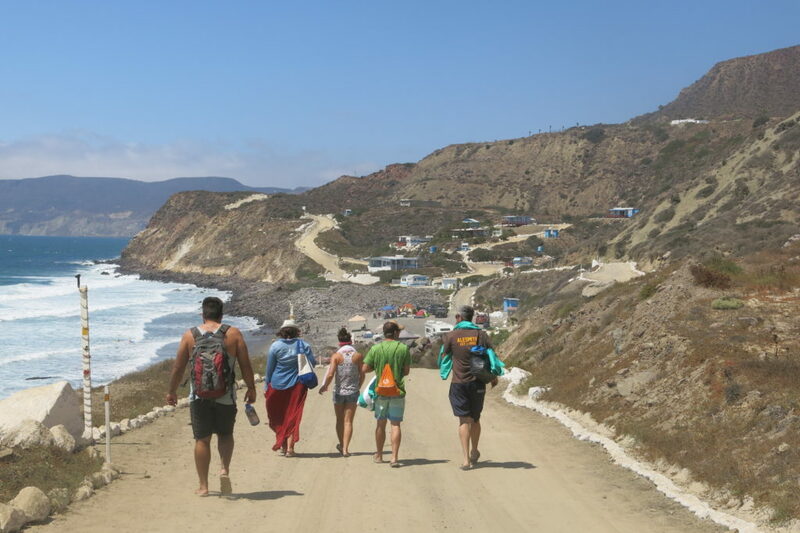 After a bit of quick research on Baja camping, we landed on Playa Saldamando, a privately owned campground just 10 minutes north of Ensenada that proved to be the perfect choice. We were able to make a reservation with the owner, George, in advance over the phone. 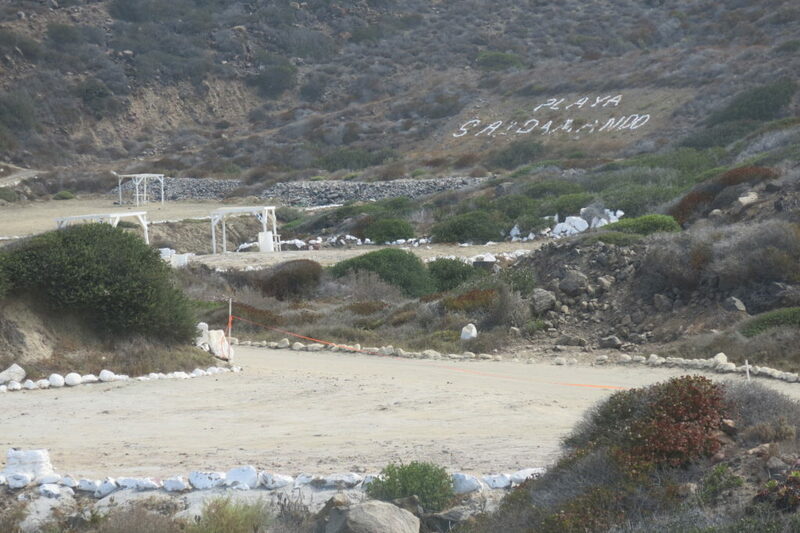 When we arrived, despite unusual traffic into Mexico (side note: If you drive, make sure to get Mexican car insurance), we found our site roped off and awaiting our arrival. and play music on a set of portable speakers for the beach without bothering our neighbors. It was pure perfection. 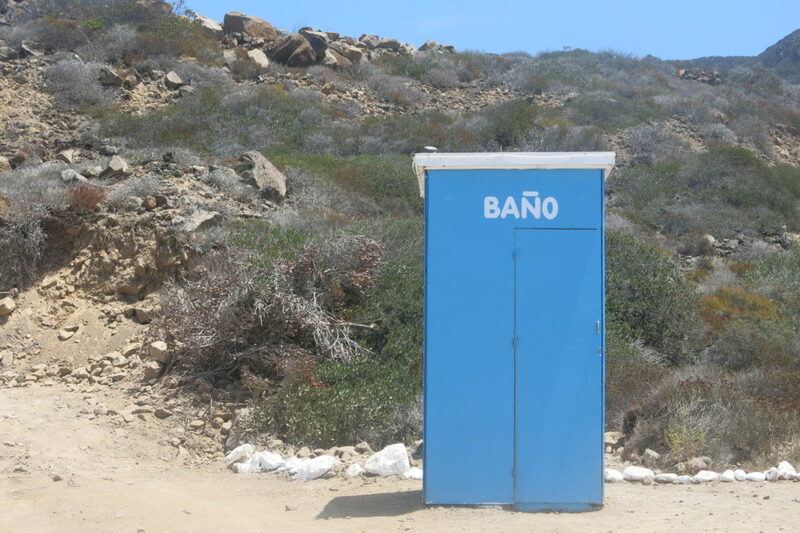 Though the grounds had a handful single-stall toilets only a short walk from each site, there weren’t any showers. Luckily we were wise enough to bring our Epic Wipes, which are basically full-sized, personal wet wipes, to wash with. We don’t often miss showering for a few days, but the Mexican sun and the sand require exception, and the Epic Wipes handled the job with grace. 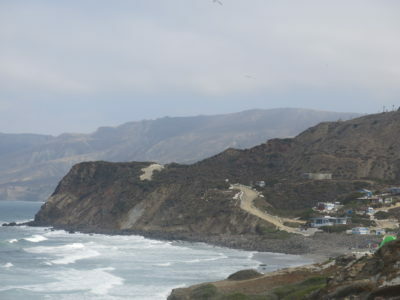 By day two, we were refreshed enough to head into Ensenada for more ice (and more beer). 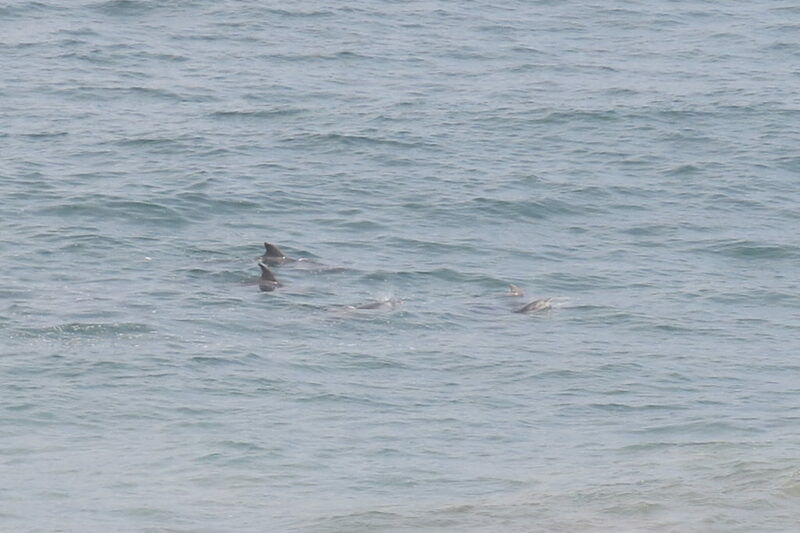 We spent the day watching other campers play on the soccer pitch, laying on the beach, and watching dolphins frolic in large pods just offshore. Mind you, I’m not kidding when I say the sun is stronger in Mexico, and protective eyewear is essential. 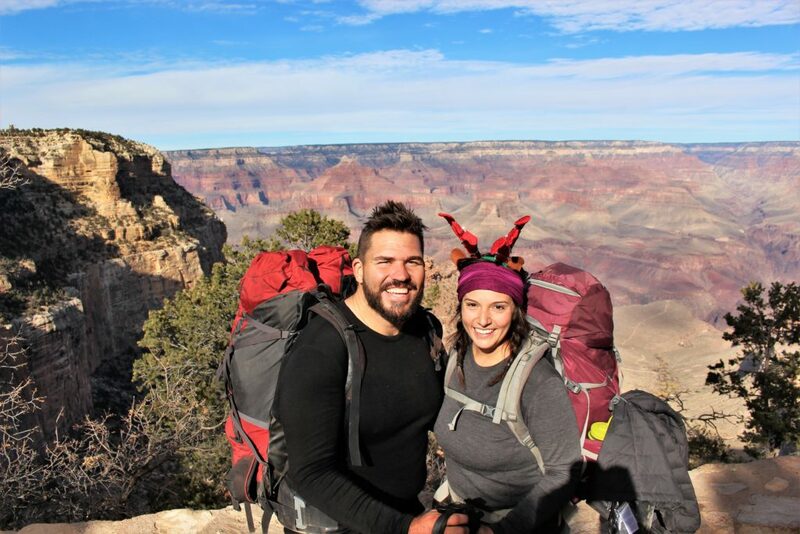 Justin and I each have a polarized pair from Vision Direct, and they come in especially handy for trips like this because they’re sturdy and they provide just enough share to see the beautiful views more clearly. All in all we got good (and safe!) sun, played in the sand, and still managed to keep clean. Though maybe the best part was on the way home, when we stopped in Puerto Nuevo for fresh-caught rock lobster and one last Mexican coke. It was almost enough to make the hours-long wait at the border worthwhile. Though I’ve no doubt that we’ll return to Playa Saldamando, sunnies in hand, as soon as we can anyway. © 2019 A Week at the Beach. All Rights Reserved.